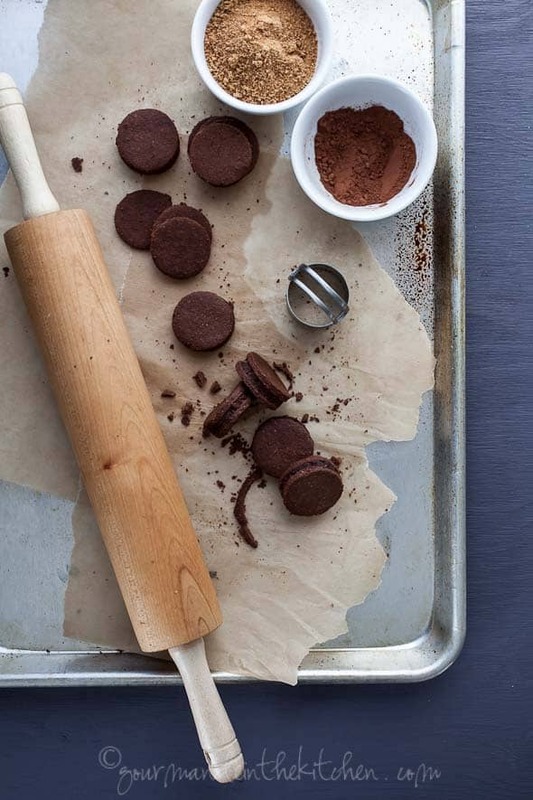 A classic sandwich cookie (aka homemade oreos) with a chocolate cream filling. With all the desserts these past couple weeks you’d think I would be done with sweets. You might even think all the baking and cookie-making will soon run its course, and you’d perhaps venture a guess that I’d be happy to skip a few days. But you’d be wrong, because I’ve become quite singularly obsessed with the thought of these cookies. 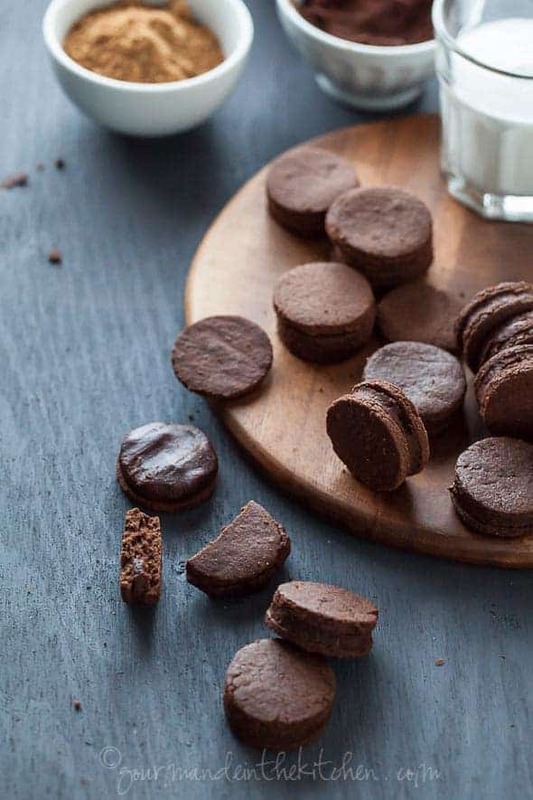 Blame it on the holidays or just an intense chocolate craving, but these thin chocolate wafer sandwich cookies have been lingering in my thoughts. Not to mention that as the days get shorter and colder, retiring to the kitchen to fire up the oven sounds quite inviting, and I think we can all agree that homemade cookies make the best gifts. With a pleasant proportion of cookie to chocolate, these will certainly be making a repeat appearance in my cookie tin this year. But if you’re like me, you hardly need an excuse to bake any time of the year. 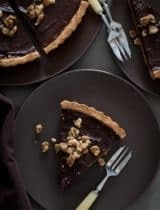 Delicate and tender with an almost shortbread-like quality and creamy chocolate filling, this updated classic is a sweet comfort. The tender, lightly sandy cookies roll and re-roll easily thanks to the lack of gluten, which means your little helpers can get their hands dirty too and get in on the cookie making fun. The minute sandy wafers are just barely sweet with the bittersweet taste of cocoa contrasting nicely with the milder and creamy chocolate filling. Eat these dunked in the milk of your choice (coconut, almond and cashew are all wonderful here if you’re going the non-dairy route) or with a cup of coffee for an afternoon treat, or package them up for a thoughtful homemade gift. A pair of delicate chocolate cookies stuffed with a creamy chocolate filling. In a medium bowl, beat together the maple syrup and melted coconut oil until well combined. 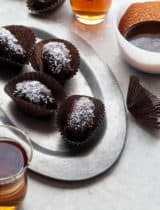 Sift together the cocoa powder, arrowroot and a pinch of salt and whisk vigorously into the maple syrup and oil mixture until creamy. In a medium bowl, whisk together the coconut flour, arrowroot, cocoa, coconut sugar, baking soda, and salt; set aside. Roll out between two sheets of parchment paper to about a 1/4-inch thickness. 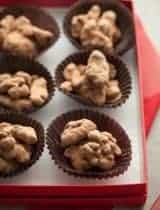 Using a about a 1-inch or 2-inch cookie cutter , cut out rounds and place on sheets, 1 inch apart. Bake 10 minutes for 1-inch cookies or 12 minutes for 2-inch cookies, rotating sheets halfway through. Let cool on baking sheet 5 minutes then transfer to wire racks, and let cool completely. Spread half the cookies with a spoonful of the chocolate cream filling; top with remaining cookies. NOTE: You can also use a chocolate coconut butter like this one to fill the cookies if you'd prefer. 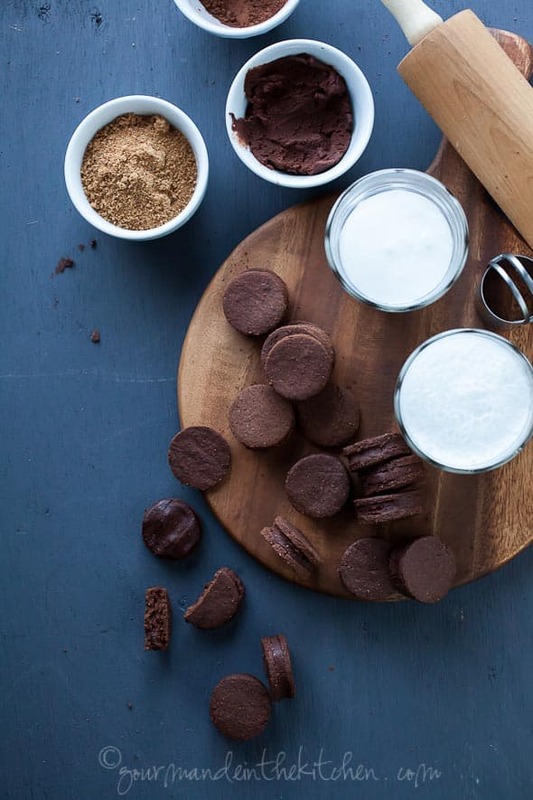 Gorgeous paleo friendly chocolate sandwich cookies, Sylvie! Today I am baking a cranberry cake, shortbread cookies and biscotti! Pinned! Chocolate on chocolate? Yes, please! omg my body hurts from wanting theses so bad. Oh man, these look AMAZING! I'm giving them a try as soon as I pick up some arrowroot. Great looking cookies Slyvie. How can we ever be overdosed with desserts and cookies right?.. Loving all your recipes. I just made a batch of gluten free hazelnut cookies and can't stop eating them. I recently made a chocolate sandwich cookie with caramel in the center. I'm really loving your chocolate on chocolate idea, though. Christmas can always use more chocolate. And more cookies. On the to-do list! Hi Shari, Thanks for catching that! I've corrected the recipe to reflect the correct amount of coconut oil/butter for the cookies. Sylvie these look incredible - love how you created these using coconut flour. And I love coconut oil in baking. Wow, these look AMAZING! And they're gluten/grain free too? Wow! Stunning photography, as always. Beauties, I love a sandwich cookie! I can practically taste these! I don't think I could ever turn a sandwich cookie down, ever. And I love that these are vegan.. Perfection. Those are fun and would be gone in under 5 minutes in my house. Happy Holidays Sylvie! Yum! My diet is about 99% clean, but I must admit, oreos are the one junk food that still tempts me! To make a more traditional vanilla cream filling, would you just leave out the cocoa powder? No the filling would be too runny without the cocoa powder. 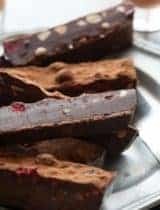 For a vanilla cream filling I would use coconut butter as the base and then stir in the amount of sweetener to taste adding a little splash of vanilla extract until you get a smooth paste. Hope that helps! For vanilla cream you'd use palm shortening and vanilla bean plus honey/ maple. I would love a dozen of these scrumptious looking cookies! Shared! These look incredible and make me think of one my favorite cookies. I'm going to have to make them this weekend. Sylvie, I'm amazed you can make such glorious little cookies that are FREE of so many things! These are beauts! And so healthy! wow Sylvie these look and sound amazing and I love how "free" they are too! My first thought was Oreos when I saw this. I think this is one that I have to try ASAP. My dad loves Oreos but he doesn't eat them anymore because of the way I eat, yay! Wow, very impressive! 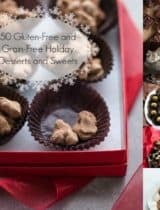 So many "free" of things in this recipe yet they look just like regular treats. 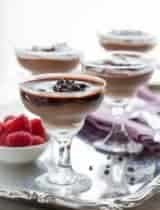 You inspire many people not to give up yet still enjoy these delicious treats. Amazing recipe, Sylvie! Just made my own version of these too! So many variations! I'm curious about the coconut sugar, wonder if I could find it in Korea. I love that these cookies are Vegan!! These look amazing, just what I have been looking for! Yes you can substitute butter if you'd like. Thanks for the recipe, but I had a hell of time trying to make these. Even adding 5 tbsp of water, the dough would barely ball, and out of the oven, over half of the wafers crumbled and were unusable. Without a binder, I don't see how this is supposed to work. Was there a trick to how you balled the dough or rolled it out? It sounds like you may have had too much flour. How did you measure out your flours, did you weight or scoop? Unfortunately there's also a lot of variance between coconut flour brands as well, some being more or less finely ground which can result in varying levels of absorbancy. Perhaps the brand you were using absorbed too much of the liquid. The dough generally holds better together when you don't overwork it otherwise some of the oil may start to separate but that doesn't sound like what happened here since it sounds like it was too dry to start. I don't have arrowroot flour, could I use tapioca flour as a sub? I've haven't tried it so I can guarantee the results, but yes usually arrowroot and tapioca starch are fairly interchangeable so I think it would be fine to use it here. Too sublime for words. I'll probably dream about making these now. Sweet,sweet dreams. I absolutely, positively cannot wait to make these. We are trying to slowly incorporate a more clean diet into our home; especially having two young preschoolers, we want to teach good habits from the start. The tradition has been (for a while) that my boys have a couple of oreos & milk with their dad every night...their one indulgence. And although we have already switched to a better quality milk, with DHA, which the boys are slowly adapting too (ha! ), the oreos are still tradition. Just this week my husband asked, can we pa-leeeease start having homemade cookies at night instead of this processed junk. So when I ran across this post & saw your comment, "basically oreos" I though to myself, "Yes! This is what we will try!" On the agenda for this afternoon! Thanks so much! Excellent, I hope you all enjoy the cookies! 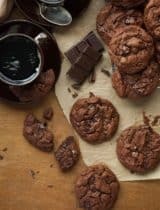 These cookies are meant to resemble the sandy somewhat drier texture of an oreo type cookie with a creamy filling but if you prefer a softer more traditional chocolate chip cookie consistency I'd suggest you try these Double Chocolate Cookies. Hope that helps! I want to make these immediatly! One question though. Is it possible to use all coconut flour, replacing the arrowroot flour in the recipe? I wouldn't recommend that or the dough will be very crumbly and hard to roll out. If you have tapioca starch you could use that instead of the arrowroot. Hope that helps! Hello, I was rather disappointed with how mine turned out. They were dry and the texture was if as a cookie had gone soft. 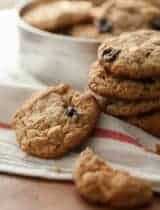 The only ingredient I substituted was arrowroot flour for tapioca flour. Could that have affected the outcome! Thanks! Arrowroot does tend to be a bit drier than tapioca but that shouldn't have affected it that much. I'd guess it might be too much coconut flour which can easily dry out baked goods and can vary greatly from brand to brand. Since the recipe was created using gluten-free flours unfortunately you won't be able to just substitute regular flour instead. Also I used tapioca instead of arrowroot. I noticed someone asked in the comments. I did add a little more water and a splash of macadamia oil because the dough needed it. Biscuits are just about gone!